is a very simple procedure that requires the collection of a small amount of adipose tissue that can be harvested in a simple outpatient session. After twelve days the ADSC, extracted from fat, are injected into the microenvironment surrounding the hair bulb. The injected cells release specific growth factors that prolong the duration of the anagen phase and improve the regeneration of the hair. With Hairskilll it is now possible to treat progressive weakening of the hair bulb, miniaturization of the hair and resulting hair loss. Hairskill is an innovative, effective and safe method, based on the use of stem cells derived from adipose tissue harvested from the patients themselves. Initial results are visible in 1 month and they gradually increase over time. The adipose derived stem cells therapy makes Hair Transplants easier because it strengthens and prepares the scalp before the transplant, and stimulates engraftment in the bulb. It is a biological product and the results vary from patient to patient according to biological age of the patient. The action of the ADSC is effective only if the bulb is not irreversibly compromised. 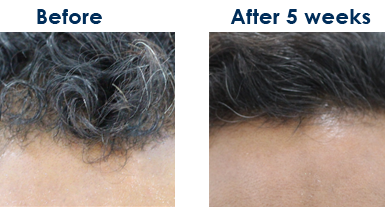 This procedure is typically used for those patients who are not surgical candidates because they are too young, or are in the early phase of hair loss.